Hi and welcome to PowerPoint Speak Easies! PowerPoint Speak Easies are a vast collection of animated "talking" characters that you add to your PowerPoint videos so they "talk" to your viewers. The video above uses just a few characters from the Speak Easies collection, but it should give you some great ideas for using them in your own PowerPoint videos. PowerPoint Speak Easies are very inexpensive and a great value for any and all video marketers. 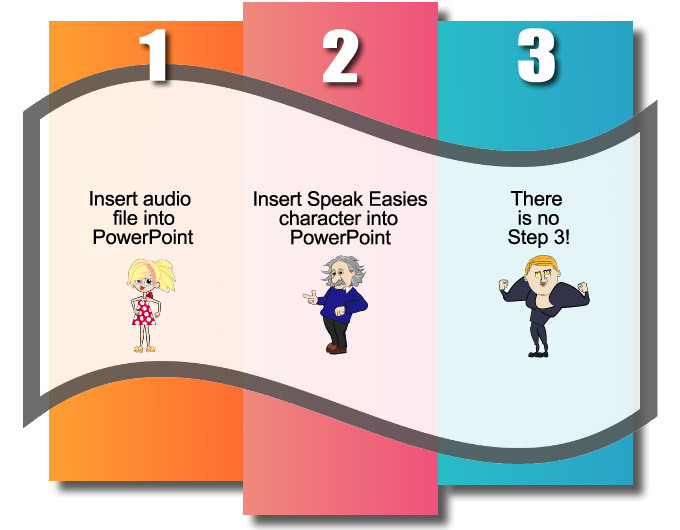 Using Speak Easies Characters to Make Your PowerPoint Videos Talk is Easy! Here's a quick one minute video that shows how easy it is to add an audio voice over to PowerPoint and have Speak Easies "speak" to your audience. Or course, there's some other cool stuff you can do with Speak Easies using very simple PowerPoint techniques...I'll show you how in the included training. Speak Easies are so big, it's impractical for me to add to a web page, which is why I added them to the videos above instead.